This is a round Trop-Artic Motor Oils porcelain sign. This particular Trop-Artic Motor Oils sign is red and tan. 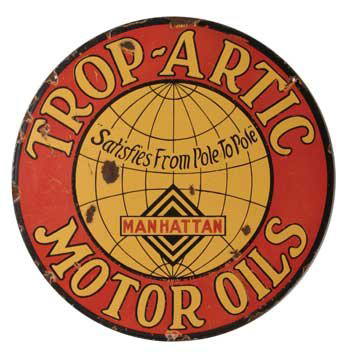 It reads, “Trop-Artic Motor Oils, Satisfies From Pole to Pole, Manhattan” and features a tan globe in the center of the sign.